New details have emerged about the tragic fate of the Malaysian Airlines Boeing 777 that crashed in eastern Ukraine in July 2014. The Russian Defense Ministry has provided documented proof that the missile that shot down Malaysia Airlines Flight 17, killing all 298 people on board, came from the arsenals of the Ukrainian army, not from Russia. At a news briefing on Monday, Lt. Gen. Nikolai Parshin, the Defense Ministry’s chief of the Missile and Artillery Directorate, said that, judging from the fragments of the 9M38 missile, military experts were able to establish the missile’s unique serial number – 8868720, where 86 stands for the missile’s production year and 8720 is its serial number. According to the documents, which Parshin said had been declassified ahead of the news conference, the missile in question was manufactured at a military plant in Dolgoprudny, outside Moscow, in 1986, assigned combat number 886847379 and on December 29 of that same year was shipped by rail to the 20152 — 223 anti-aircraft missile brigade stationed in Ukraine. In 1986, the unit was part of the Carpathian Military District and was deployed in Terebovlya, Ternopil region. After the Soviet breakup, the brigade became part of the Ukrainian Armed Forces and is currently stationed in the city of Stryi. According to the Russian Defense Ministry, the missile brigade took part in Kiev’s military operation in Donbass. Dutch-led international investigation used as evidence that the BUK missile system allegedly used to shoot down the Malaysian Airlines jet had been transported from Russia to the Donetsk region in eastern Ukraine. This conclusion was made by Russian experts who studied video footage of the BUK system and determined that the images of the prime mover, trailer and the BUK system itself had been superimposed on a section of the street. Also presented at the news conference was an intercepted audio recording of an exchange between Ukrainian servicemen during a 2017 drill in near Odessa. According to the Russian Defense Ministry, one of the voices on the recording belongs to Ukrainian Army Colonel Ruslan Hrynchak, who in 2015 commanded the 164 radio-engineering brigade in charge of controlling the airspace over Donbass. 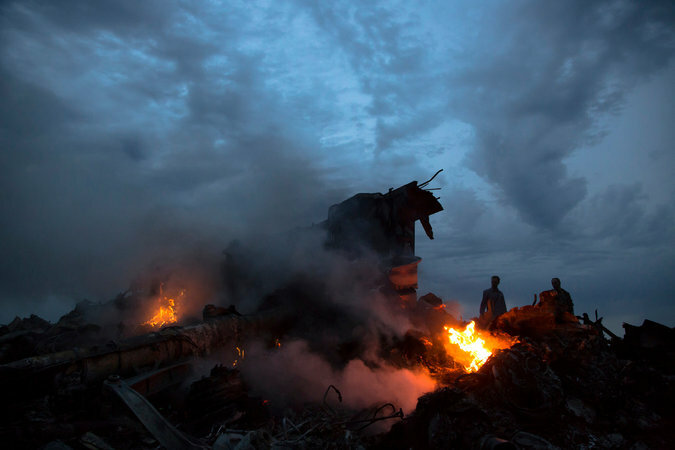 On July 17, 2014, a Malaysia Airlines Boeing 777 en route from Amsterdam to Kuala Lumpur crashed near the city of Donetsk in eastern Ukraine killing all 298 passengers and crew on board; Kiev immediately blamed local militias for shooting down the plane. Representatives of the local militia denied the charge, arguing that they simply had no weapons capable of downing such an aircraft.